In the United States, radio listenership is gauged by Nielsen and others for both commercial radio and public radio. Nielsen and similar services provide estimates by regional market and by standard daypart, but does not compile nationwide information by host. Because there are significant gaps in Nielsen's coverage in rural areas, and because there are only a few markets where the company's proprietary data can be compared against competing ratings measurers, there is a great deal of estimation and interpolation when attempting to compile a list of the most-listened-to radio programs in the United States. Nielsen itself admits the task of measuring individual shows would be too complicated and difficult for them to manage. In contrast, because most UK radio broadcasts are distributed consistently and nationwide, the complications of measuring audiences that are present in American radio are not present on British radio. Talkers Magazine, an American trade publication focusing on talk radio, formerly compiled a list of the most-listened-to commercial long-form talk shows in the United States, based primarily on Nielsen data and estimated to the nearest 250,000 listeners. In addition to Talkers' independent analyses, radio companies of all formats include estimates of audience in news releases. The nature of news releases allows radio companies to inflate their listener totals by obscuring the difference between listeners at any given time, cumulative listenership over a time frame, and potential audience. The total listenership for terrestrial radio as of March 2014 was 244 million, up from 230 million in 2005. Sirius XM Radio has a base of 30.6 million subscribers as of 2016. American Top 40 attracts over 20 million listeners per week. Rush Limbaugh's show has been the number one commercial talk show since at least 1991 when record keeping began. NPR's Morning Edition and All Things Considered are the two most popular news programs. Tom Kent self-estimates his listenership at over 23 million weekly listeners over all of his network's programs, which span the classic hits, adult hits and hot adult contemporary formats. Until the development of portable people meters, Arbitron (Nielsen's predecessor in the radio measurement business) did not have the capability to measure individual airings of a program the way Nielsen Ratings can for television, and as such, it only measures in three-month moving averages each month. Portable people meters are currently only available in the largest markets Arbitron serves. Thus, it is impossible under current survey techniques to determine the listenership of an individual event such as the Super Bowl. For most of its existence, Talkers Magazine compiled Arbitron's data, along with other sources, to estimate the minimum weekly audiences of various commercial long-form talk radio shows; its list was updated monthly until the magazine unceremoniously dropped the feature in 2016. NPR and APM compile Arbitron's data for its public radio shows and releases analysis through press releases. Note on broadcast time: because of the effects of time on North American broadcasting, nationally syndicated shows that air live will end up on different dayparts in different time zones. The above list makes note of this. Note that although shows such as Beck's and Levin's are listed under "West Coast" drive times, that their shows are based on the East Coast (and thus air in early midday and early evening time slots there). Their dayparts are indicated as such for the purposes of clarity and consistency. The pay service Sirius XM Radio was monitored directly by Arbitron from 2007 to early 2008. The final numbers available, from early 2008 (prior to when XM and Sirius merged) had The Howard Stern Show being the most listened-to show on either platform, with Stern's Howard 100 channel netting a "cume" of 1.2 million listeners and Howard 101 (the secondary and replay channel) netting an additional 500,000 listeners. Sirius had 8.3 million total subscribers in early 2008, and now has more than 30 million. Eastlan Ratings, a service that competes with Arbitron in several markets, includes satellite radio channels in its local ratings; Howard 100 has registered above several lower-end local stations in the markets Eastlan serves, the only satellite station to do so. Virtually all of the most-listened-to radio programs in the United States are in English. Other than English, only Spanish has an audience large enough to establish national networks; data for shows in Spanish are much more limited. Other languages (Chinese, Korean, various languages of India, and French) are broadcast only on a local level. Beginning with the 1930-31 radio season, three ratings services measured radio listenership totals. The Cooperative Analysis of Broadcasting did so through 1934-35. From 1935-36 through 1948-49, the bulk of radio’s “golden age,” C.E. Hooper monitored the numbers, which were popularly called “Hooperatings.” The A.C. Nielsen company, which continues to measure television ratings today, took over American radio's ratings beginning with the 1949-50 radio season and ending in 1955-56. During this era, nearly all of radio’s most popular programs were broadcast on one of three networks: NBC Red, NBC Blue, or CBS’ Columbia network. At his peak in the late 1930s, commentator Charles Coughlin was renowned for his large and passionate listener base. Because his show was not a network broadcast, but was instead syndicated on 36 stations, determining how many listeners he had has proven difficult. Some modern estimates peg his listenership at approximately 30 million listeners. President Franklin Roosevelt's irregularly scheduled fireside chats, simulcast on all of the major networks, consistently reached over 50 percent of the listening audience during his last five years in office. Though radio listenership totals collapsed dramatically in the 1950s with the advent of television, some radio programs attracted large audiences decades later, notably Howard Stern. Before moving to satellite radio in 2006, The Howard Stern Show peaked at 20 million listeners on syndicated terrestrial radio. Unlike the above programs, Stern's radio show was broadcast daily, for 4–5 hours per day. Paul Harvey, at his peak, drew an estimated 25 million listeners to his 15-minute daily program. At his peak in the 1990s, The Rush Limbaugh Show was drawing as many as 20 million listeners a week; as of 1998, Stern, Limbaugh and then-first-place Dr. Laura Schlessinger were drawing between 17 and 18 million listeners according to Talkers estimates. At the time of both shows' departure from Talk Radio Network in fall 2012, The Savage Nation was estimated to have an audience of 9 million listeners and The Laura Ingraham Show was estimated at 6 million listeners. The later revivals of both of those shows were much smaller, each only registering an estimated 3 million listeners as of April 2013. Prior to his retirement, Neal Boortz registered approximately 5.75 million listeners. The public radio series Car Talk with Click and Clack had approximately 4 million listeners immediately prior to ending its original run, ranking it among the most-listened-to weekend radio programs in the United States. Talk of the Nation registered at 3.2 million listeners prior to its cancellation in 2013. Immediately prior to Blair Garner's departure from the show in July 2013, After Midnite was quoted as drawing 2.7 million listeners, the most of any country music show for which listenership estimates are made available. Total listenership in the United Kingdom in March 2015 was 47.799 million, all BBC programming had 34.872 million listeners, and all commercial programming had 33.916 million listeners. The figures counted listeners over the age of 15 who tuned in for at least five minutes. A State of Trance with Armin van Buuren has more than 30 million listeners. American Top 40 with Ryan Seacrest has an estimated 20 million listeners worldwide. Intelligence for Your Life with John Tesh has an estimated 8.2 million listeners across the United States, Canada and United Kingdom. 1 2 "The Top Talk Radio Audiences". Talkers magazine. September 2013. Retrieved 2013-10-13. ↑ Farhi, Paul (7 March 2009). "Limbaugh's Audience Size? It's Largely Up in the Air". The Washington Post. ↑ The state of radio today: a focus on African-American & Hispanic audiences. Nielsen Audio (April 2014). Retrieved May 6, 2014. ↑ Manly, Lorne (5 April 2005). "Satellite Radio Takes Off, Altering the Airwaves". New York Times. Retrieved 2008-12-18. Still, satellite radio is also unlikely to inflict fatal damage on commercial radio, which has about 230 million listeners, according to Arbitron, the radio ratings provider. ↑ "SiriusXM Grows Subs, Earnings in Second Quarter, Raises Full-Year Targets". Hollywood Reporter. Retrieved 26 July 2016. 1 2 "American Top 40 Celebrates 40th Anniversary This Weekend". Clear Channel. 2010. Retrieved 2010-12-07. "American Top 40 is the soundtrack to life; it sparks emotion and memories, and has a huge impact on pop culture," stated Seacrest, music's number one radio host in the U.S. with a weekly worldwide audience estimated at more than 20 million. ↑ Chafets, Zev (July 6, 2008). "Late-Period Limbaugh". New York Times. Retrieved 2008-12-18. Talkers magazine, a trade publication, puts Limbaugh's weekly audience at 14 million. 1 2 "NPR REACHES NEW AUDIENCE HIGH". National Public Radio. 2009. Retrieved 2010-12-07. All Things Considered increased its audience by 15% over the previous year to rise from 11.5 million to 13 million listeners weekly becoming the second NPR newsmagazine to top 13 million. Morning Edition reached nearly 14 million listeners weekly, 9% above Fall 2007 numbers. ↑ HISTORY - Tom Kent Radio Network. "2014: (…) TKRN reaches 400 station affiliate mark with over 23 million weekly listeners! " 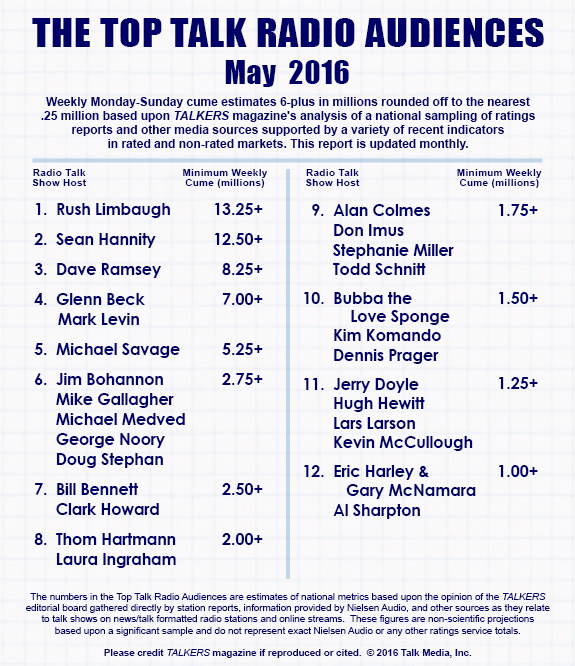 ↑ "The Top Talk Radio Audiences (Updated 1/15)". Talkers Magazine. Retrieved 29 January 2015. ↑ "NPR's Car Talk Listeners Pick Ugliest New Car". National Public Radio. 2005. Retrieved 2010-12-07. Car Talk is public radio's most popular entertainment program, airing on nearly 600 stations with more than 4.4 million listeners a week tuning in for an hour-long tune-up on car advice and humor. ↑ "NPR Programs Attract Record-Breaking Audiences Public Radio Listenership at All-Time High". National Public Radio. 2002. Retrieved 2008-12-17. Growth in the NPR news/talk audience outpaced similar gains realized by commercial news/talk radio. ↑ Freedman, Samuel G. (2005-07-17). "'Listener Supported' and 'NPR': All Things Considered". New York Times. Retrieved 2008-12-17. National Public Radio alone reaches more than 20 million listeners, and its daily newsmagazine shows, All Things Considered and Morning Edition, attract a larger audience than any program except Rush Limbaugh's. ↑ "The Top Talk Radio Audiences". Talkers magazine. May 2016. Retrieved 10 June 2016. ↑ "All Things Considered". National Public Media. Retrieved 12 October 2016. ↑ "Morning Edition". National Public Media. Retrieved 12 October 2016. ↑ Ravitz, Jessica (February 14, 2012). Talking off-air with Delilah, the 'Queen of Sappy Love Songs'. CNN. Retrieved April 9, 2014. ↑ "American Public Media, Nation's Second Largest Public Radio Company, Announces it Now Serves 14.6 Million Listeners Each Week, a 14 Percent Audience Increase". PR Newswire. Retrieved 10 January 2012. ↑ Note that the network conflates the Marketplace Morning Report (which airs during Morning Edition in most markets) with the stand-alone program Marketplace and does not make individual ratings for each show available). ↑ Baenen, Jeff (April 12, 2016). Goodbye, Lake Wobegon: 'Prairie Home' is getting a new host. AP. Retrieved April 13, 2016. ↑ "NPR News Quiz 'Wait Wait… Don't Tell Me!' Brings Laughs To The Big Screen, Starring Peter Sagal And Carl Kasell" (5 February 2013). NPR. Retrieved 19 February 2013. ↑ Self-estimated; may include listenership from daily vignettes inserted into local shows. About the Country Music Greats Radio Show. Retrieved March 21, 2016. "Cumulative listenership exceeds 3.2 million (audience based upon station reporting)." ↑ Originally aired in West Coast PM drive until 2016. ↑ Hinckley, David. Howard Stern rules satellite radio. New York Daily News. 7 May 2008. ↑ "Eastlan Ratings: Syracuse". CNYRadio.com / CNYTVNews.com. Retrieved 13 October 2014. ↑ Douglas B. Craig (2005). Fireside Politics: Radio and Political Culture in the United States, 1920-1940. Johns Hopkins University Press. p. 156. ↑ Sullivan, James (14 December 2005). "Love him or hate him, Stern is a true pioneer". msnbc.com. Retrieved 13 June 2012. ↑ Michael Carlson, "Obituary: Paul Harvey", The Guardian, March 3, 2009. ↑ Michaelson, Judith (March 26, 1998). A Rush to Dr. Laura? ; Survey puts Schlessinger, Stern ahead of Limbaugh as leading talk hosts. But not everyone agrees. Los Angeles Times. Retrieved August 12, 2015. ↑ "BBC World Service records its best listening figures ever despite cuts". BBC. June 2, 2009. Retrieved 2009-06-23. It uses multiple platforms to reach 188 million users globally, including shortwave, AM, FM, digital satellite and cable channels. ↑ About John. Tesh.com. Retrieved October 17, 2012.